It’s no secret that architects Laura Davis and Holly Hall of hpd architecture + interiors share a passion for architectural historic preservation, however the American idea of historic preservation pales in comparison to our European counterparts. With America only being 200+ years old, it’s difficult to imagine the complexities of restoring buildings that are four times as senior as our entire country. 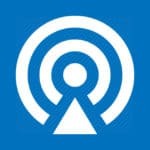 We recently had the distinct pleasure to speak with the President of the American Friends for the Preservation of Saint Germain des Prés, David Sheppe We captured the conversation in a recent interview on The Architecture Happy Hour podcast, and learned about the Saint Germain des Prés Church, the oldest church in Paris, France. The church is located near the Seine River in the Latin Quarter of Paris, which is considered the center of “the beating heart of Paris.’’ The church and abbey that surrounded it have always been a spiritual center for worship as well as an intellectual center. David lived in the church’s neighborhood, a community known for its buildings, art, and publishing. He became very interested in the church’s history, and ultimately, the restoration of the Saint Germain des Prés soon became David’s passion project. While most will tell you the Saint Germain des Prés is 1,000 years old, others will say it is actually 1,500 years old. The original church and abbey were founded in 543 AD. A wooden church was constructed but over the next several centuries it suffered many indignities including being burned down by the Vikings in 875 AD. The church was rebuilt a couple of times over the years and the permanent church was constructed and completed in 1014. In fact, the current church sits on precisely the same footprint as its antecedent churches. It had its millennial celebration in 2014! To give you a feel for what an amazing feat this construction was during that time period, they were building with massive timber and stones and creating intricate carvings while in America, our early inhabitants were building with mud bricks! The construction of the Saint Germain des Prés church in 1014 was 600 years before Jamestown was founded in Virginia and 700 years before George Washington was born! It was built some 100 years prior to structures like Notre Dame Cathedral, which was created using technology like stone masonry, pulleys, ropes, manpower, etc. The building of the Duomo Cathedral in Florence began even later (1300s-to-mid-1400s), and structures such as the Palace of Versailles and the Luxembourg Palace came out of the French Renaissance in the 16th and 17th centuries. All of these structures were built well after the Saint Germain des Prés yet massive timber and stones had been used to create this amazing church! Hand printing and movable type printing as well as libraries were found in its buildings. Additionally, the first Bible printed in French was printed within the confines of the abbey. The church was under the threat of being demolished in 1802 because it had suffered badly during the French Revolution. It had been desacralized, had been converted to a gun powder storehouse, and endured an explosion. While city architects declared the church as unsalvageable, parishioners and other champions, including famous novelist Victor Hugo, lobbied to save it. The last major restoration project began in 1840 and lasted thirty years. Since then, the church has suffered the ravages of time including moisture, water leaks, mold, soot-covered murals (dated back to the mid 19th century), and stained glass windows, pillars, woodwork, and plaster that are in disrepair. While the church belongs to the city of Paris, its interior belongs to the parish. A committee was created in France in 2012 to discuss the church’s structural issues. A plan of restoration was put together and is being managed by the city of Paris via Architect Pierre-Antoine Gatier. All work is being accomplished by special preservationists under Gatier’s guidance. A master plan of seven tranches has been implemented contingent upon funding for each of the tranches being raised before the next tranch is undertaken. Not wanting to get “hip deep” into a project that they can’t complete, the city of Paris wants to see a completed “mini project” (each tranch) before they move on to subsequent tranches. The goal for the completion of the restoration is before the end of 2021. Intellectual centers like the Saint Germain des Prés church attract the devoted, intelligent, and people with missions and funding—all growing together and moving forward in a community where they are equally interested in preservation. The French government required that 85 percent of the restorative costs for the church’s restoration must come from private parties vs. French tax payers. In addition to fundraisers established in France, an American sister nonprofit organization, American Friends for the Preservation of Saint Germain des Prés, was founded in New York and a 501 C(3) was created. They now work hand-in-hand with their French counterparts at The Preservation of Saint Germain des Prés Foundation in fundraising and preservation efforts. 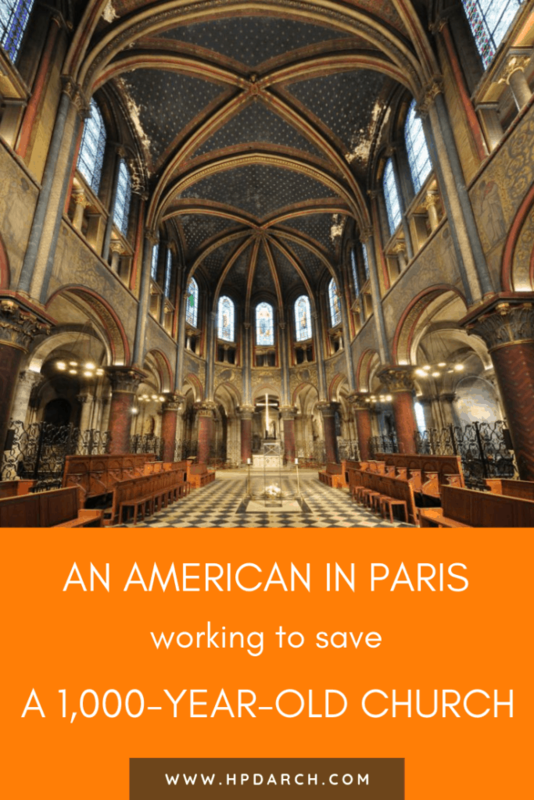 The American organization is made up of a large group of former French church parishioners who now reside in New York, history buffs, American soldiers who served in France, and tourists, like David, who fell in love with the church. David joined the American effort in 2016 and was recently named president of the board. He is now in full fundraising mode to help reach a six-million dollar target for finishing the restorative work over the next 2-2.5 years. Major donor funding via those who want to contribute a substantial amount towards the cause. Small-dollar donors—an equally-important fundraising effort. Donors can donate $100 to the Adopt a Saint Germain Star Campaign, and in return have a star named after a child, grandparents, a friend, a fallen soldier, etc., or be kept anonymous. The church itself has a vaulted ceiling that is studded with 3,500 gold stars, which have been exquisitely restored. The Adopt a Saint Germain Star Campaign is a brilliant way to connect donors with the church. Americans are very generous towards things that they believe in. An overwhelming majority of people love the Adopt a Star campaign and preserving something that will be around for thousands of years to come. CLICK HERE to view a video of the Adopt a Star campaign. As restorative efforts continue on the Saint Germain des Prés church funding will have to keep up with the works of the restoration. According to David, “timelessness is not connected to great age”. We have buildings in America that are also timeless and that speak to us over time. Whether built in 1014 or the 1700s, those buildings are deserving of our attention and preservation where needed because they speak to our history and future. The Saint Germain des Prés is a living church so if you are visiting Paris, the church is open 24/7 and admittance and tours are free. 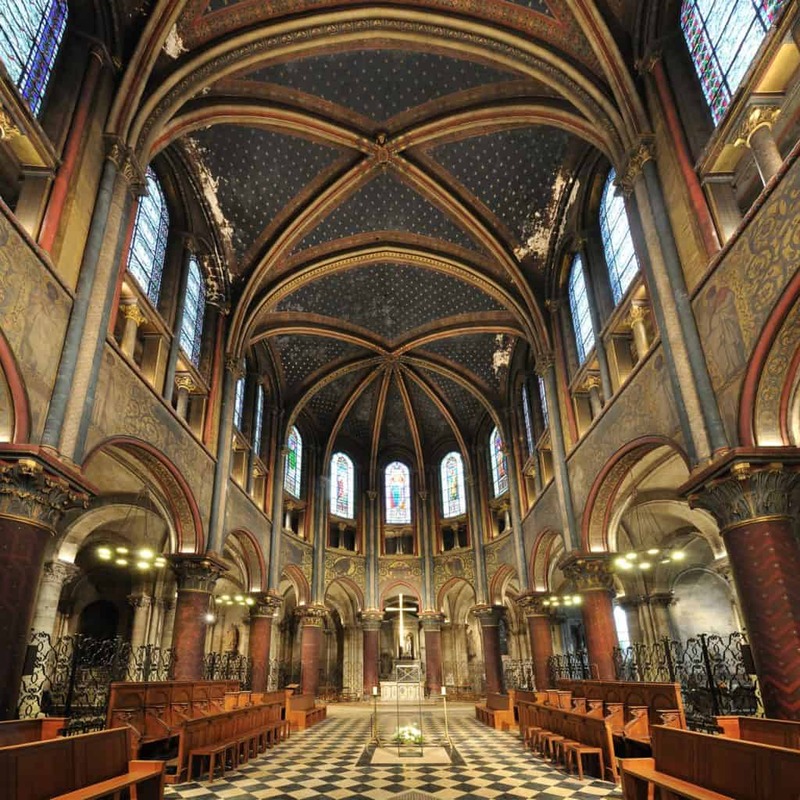 Pursue your passion for historic preservation and get involved in the restoration of the Saint Germain des Prés Church. 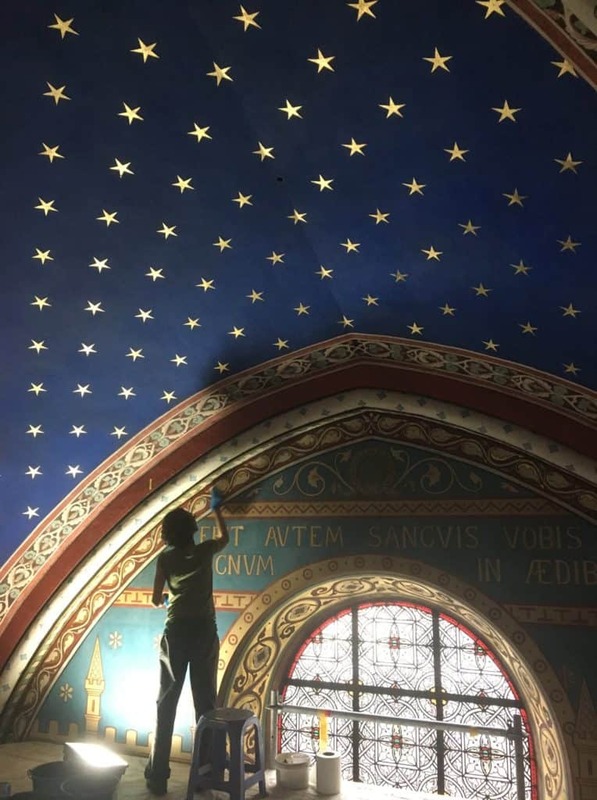 You can read about its history and restorative works on the American Friends’ website, watch a video on YouTube, follow American Friends’ on Facebook, or Adopt a Star. Getting involved in this historic preservation project may ultimately become your personal labor of love! 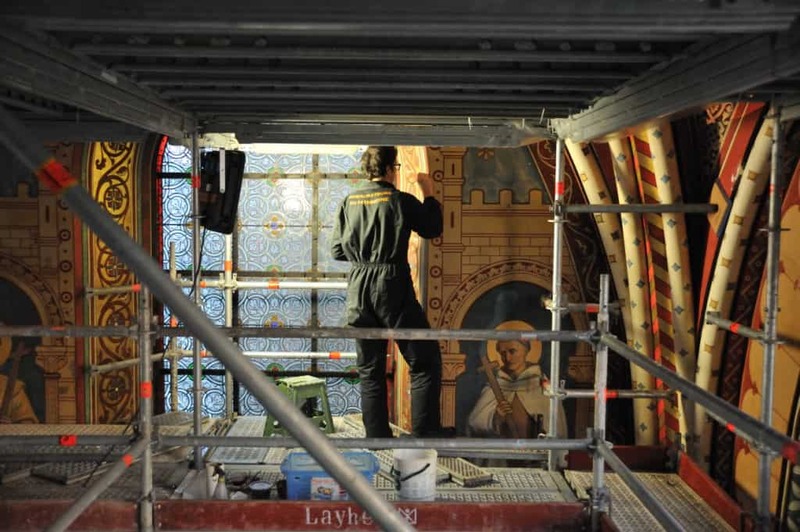 CLICK HERE to listen to our full podcast interview with David Sheppe regarding the preservation of Paris’ Saint Germain des Prés church. CLICK HERE to listen to our podcast pertaining to restoration efforts of Dallas’ Alexander Mansion, or read our blog, The Alexander Mansion – a Home Restoration Love Story. Do you have a home or building worth preserving in your community? CLICK HERE to read our 6 Tips for Starting a Home Restoration Project. Are you involved in a special restoration project in your hometown? We’d LOVE to hear about it and see pictures. You can reach out to us on our Facebook or call us at 214.751.2304. Follow hpd architecture + interiors on Twitter and Instagram. Want to save this article for later? Pin it!